Ancient ritual-trance music instrument of the Australian natives is made from hollowed out by termites eucalyptus limbs and tree trunks. The sound of Yidaki is regarded closer to nature than of any other instrument. With its distinctive a low-pitch, resonant sound it is traditionally used by Australian natives for Coroboree rituals. While similar instruments are made of bamboo, reed and nowadays even plastic, their timbre is unmistakably different from yidaki's. Playing a didgeridoo requires a unique technique called circular breathing that makes it possible to inhale without interrupting the sound. Performer's lips, tongue, throat, jaws and vocal cords, all participate in sound forming process. That explains very individual character of didgeridoo. Basically Yidaki has only single tone but with addition of voice, sound interference allows to create various sounds ranging from thunder to imitation of calls and roars of birds and other Animals. Sound timber can be greatly changed with the help of tongue, lips, oral cavity and varying strength of inhalation. Roughly speaking there are two main musical styles played on Yidaki: trance-meditative and rhythmic. The first style speaks for itself. The second one is of interest because it is essentially a form of rhythmic breathing practice, for the forced inhalation should be built organically into the "body" of continuous rhythmic figure. As a result it is a kind of breathing technique which resembles some famous breathing methods. So, it is possible to express cumulative ideology of didgeridoo in the following summation: "breathing + sound + rhythm". 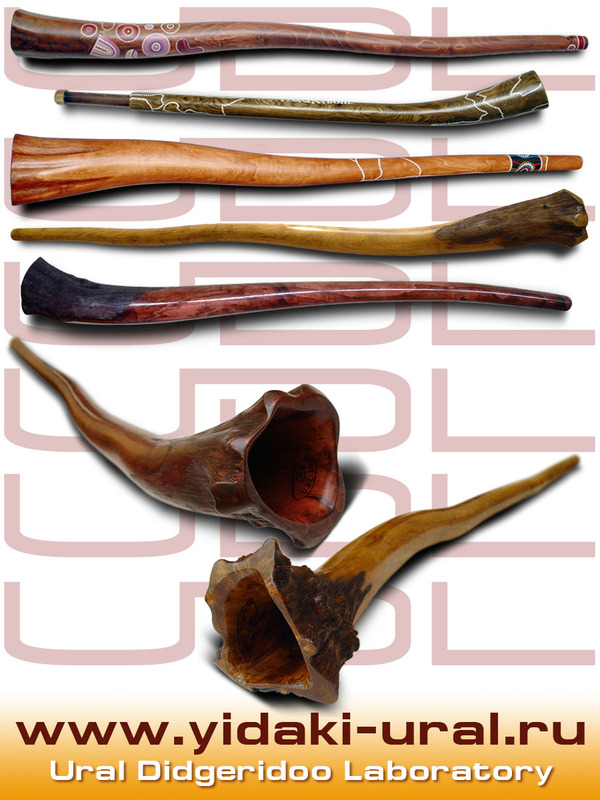 What is the distinctive feature of Ural didgeridoo? The fact is that beautiful sound and a wide range of possibilities depend on how correctly the instrument has been made in respect to acoustics. It is obvious that termites hollow out tubes without thinking about the laws of acoustics. It is a natural process. But owing to concourse of circumstances these industrious and gluttonous insects sometimes succeeds in creating a well-sounding tube. But the second condition is that the tube should be found by an Australian native. So it is evident that a good natural instrument is rarity. Therefore the primary task of “handicraft artificial didgeridoo-building” sounds in the following way: it is necessary to make an acoustically perfect instrument and at the same time to recreate natural sound of it. This task was successfully solved in the Ural Didgeridoo Laboratory. During the process of creating instruments our Adept (Anatoly Kutsenko) keeps all essential parameters: configuration of channel, specified wall thickness (error 0,5mm for the full length of the instrument), parameters of inside grooves etc. Many things have been found out and optimized while using experimental methods. There are both mistakes and achievements on this way. The point is that many qualities of didgeridoo sometimes depend upon mutually exclusive parameters. It is very important to know for what purpose this or that instrument is bought or ordered and what expectations a customer has. That is why we try to keep close relations with each customer. We still continue to make experiment with configuration of didgeridoo and so each Ural didgeridoo has something unique and peculiar like each musician. - then N6, N7, N8, N16, N17, N22 and N25. It does not mean that the rest of the instruments are worse. Nothing of the kind! But the instruments mentioned above are just excellent.